I think we mostly stayed around the flat in the daytime, more unpacking etc. I think I spent some of this morning making the back bedroom habitable - putting insulation film and draught excluder tape around the patio doors, and putting up the "thermal" curtains. That, coupled with the fact I'd forgotten we'd actually turned off the radiator in there, made a world of difference. In fact it became quite a nice little cosy room. I think this was probably a turning point - having overcome the frustration of having bought a bed we couldn't sleep in - when I went from finding everything about the new flat just plain awful, to actually starting to think maybe it wasn't all bad. 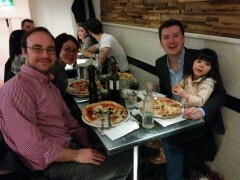 In the evening we went out for dinner at Franco Manca on Tottenham Court Road with Ben, a friend from university days, who is currently staying in London whilst looking for a new job here. Despite our efforts to get there as early as possible there was still a big queue outside, not long after 6. Erika didn't seem to mind too much though, and we did eventually make it in. As is often the case we couldn't really get her to eat much, and after a while it occurred to me we'd rather unwisely come out without any nappies - which meant I had to rush out with Erika to find a shop to address that. I suppose that gave Ben and Chie a bit more time to catch up though. Actually managed a full day in the office today, with regular sort of working hours, which was a bit of a relief. The new commute is obviously not much fun compared to the days of walking to work, but I suppose I'm getting used to it. In the evening I fancied curry for dinner, particularly because Chie had already fed Erika before I got home so I didn't have to worry about finding something not too spicy / not too unhealthy for her for a change. I tried one of the nearby Indian restaurants which I'd read some good reviews for. It was pretty busy, and there was a long wait for the food (I actually popped back home for a bit with starters so Chie wouldn't starve) but they gave me lots of freebies as their way of saying sorry, and I was entertained while I was waiting in there by what seemed to be a Father Ted esque table full of priests. The food when we finally got it was actually quite good. Today it was my turn again to help Erika settle in at nursery, and again they only wanted her to come along for an hour or two in the afternoon, from 2:30. So in the morning I thought we might as well go a bit further afield than the immediate neighbourhood, and ventured down into the centre. I'd been wanting to get Erika some toy money for a while, as whenever I'd empty out my pockets of change on the window sill, Erika would climb up and play with it, and Chie would get annoyed because "you don't know where it's been". So we had a lovely time in Hamley's playing with lots of different toys, and impressively walked out with just the one thing we intended to buy - a small pack of toy money (which cost £5, and contained £1132 - seemed like a bargain to me). After that, Erika wanted to have a babycino, and lunchtime was approaching, so we went for an early lunch at Tibits, it being not too far from Hamley's. It's always pot luck how much Erika will eat, seemingly no matter how hard we try and choose something we thing she'll like. This time, perhaps helped by the timing, she ate really well to the extent that, delightfully, I was left feeling hungry afterwards. Then we headed back up North, and Erika went for her next settling in session at nursery, again with me waiting in the office. This time though, after we got home, and Chie got back, I decided to go into the office for a few hours in the evening so I only had to take a half day off. It was my turn today to help Erika settle in to her new nursery. For her first few months there, we'd only been able to get two full days a week, and three half days. So Tuesdays to Thursday she'll only be going in the afternoon. So today, in line with that, we had the morning to ourselves before she was due to go in the afternoon. I tried to make the morning fun for her, so we had breakfast at Bear + Wolf, followed by a long play in the play room there, then a visit to a nearby playground, followed by lunch at "the Arancini Factory" which I thought Erika might like, because she likes rice, but as it turned out she wasn't all that keen. After that I took her to nursery - naively thinking I'd just hang around for 15 minutes, then, because this was her third day at the new place, and because she'd been going to the previous nursery for 18 months, I'd be able to just sneak off and go to work. As it turned out though, in the settling in week they only expect her to be there for an hour or two each day, and I was required to stay there (albeit hidden away in the office) the whole time. Still, it was rather nice watching her have fun running around the garden through the window. After that, having accepted the fact I'd just be taking the whole day off work, Erika and I went on a long trek to our nearest Waitrose, all the way over on Holloway Road (it's about a 25 minute walk). Erika fell alseep en route. I got a bit downhearted about the fact that we'd bought a new bed (thinking about it, having always lived in furnished / rented accommodation, with the exception of the very basic futon we had in Japan I've never actually bought a bed before) which was effectively unusable, because the room it was in had no curtains and was too cold. So, on the way back from work, I diverted by way of Homebase again, and bought curtain rails, and various products to try and improve the insulation in the back bedroom (that naff film you put over windows, and some draught excluder tape). I also spent a while utterly bewildered by the dazzling array of Polyfilla on offer. I'd naively assumed there was just one type, but in fact there seemed to be closer to a dozen, all for slightly different applications. In the end luckily I found "best Polyfilla" and was left wondering why the others existed at all. Grabbed a quick dinner at Dirty Burger on the way back, then set about an evening of DIY. I started by using "best" Polyfilla to fill in the cracks around the architrave of the door to our flat, which had been caused by having a new door installed. This seemed quite important to get done today as the hallway was going to be repainted, starting tomorrow. I'd never done this sort of thing before, so was quite pleased with my handiwork - even before repainting it looked a lot better. I'd ordered us a new bed (the old flat was furnished, so the bed there wasn't ours), which arrived today, and so I stayed home for some of the day to wait for that, whilst Chie took Erika to start her settling in period at her new nursery. We'd decided to put our bed in the funny little back bedroom, which just about fit a king sized bed and not much else (and fortunately we'd kept the patio doors or else the delivery guys might not have been able to get it in). Unfortunately the back bedroom didn't yet have curtains, and, we'd noticed since we'd moved in, being quite exposed, was really quite cold, so in fact we didn't sleep on it for the first couple of nights, continuing instead to camp out on the blow up bed in the larger bedroom which was nominally Erika's. Quite a lot of the day similarly spent unpacking and trying to make the place livable. The people in the other flat in the building had arranged to have the communal hallway and the front door repainted, and as they were planning to sell, suggested we choose the paint for the front door, since we'd have to live with it for longer than them. So we ventured out to Homebase this afternoon - after a bit of research I'd found the easiest one to get to was in a big retail park at Harringay Green Lanes, which was a short journey on the overground from Gospel Oak, not too far from the flat. It was around lunchtime when we arrived, and we decided since we were in the area to go for lunch at Diyarbakir, the Turkish restaurant on Green Lanes we'd been to with Chie's friend Naoko-san a while back. Initially Erika was sleeping, but woke up towards the end of the meal and nibbled on a few things of ours. I'd come down with a cold, and had not been feeling very well this weekend, and had been really quite feverish the night before, so had set out for Homebase dressed as warmly as possible, wearing whatever clothes came to hand from the disorganised chaos of moving boxes. So it turned out I was wearing an awful baggy "Dad jumper" I'd bought in John Lewis years ago because I was out for the day without sufficiently warm clothes and it was cold. I found some amusement in the incredibly banal setting of my new life - I had just moved into a home I owned, I was wearing a Dad jumper, and on a rainy Sunday afternoon I was going to Homebase to buy paint. Erika found Homebase surprisingly enjoyable - there were all sorts of odd things she hadn't seen before, and so I suppose by proxy I oddly enjoyed it myself too. Particularly the garden section, wherein we bought Erika a pink watering can, and a couple of plants for the garden. First full day in the new flat. I spent most of the morning furiously trying to ventilate the place, as a result of Erika having been quite unwell overnight. Chiefly I spent getting on for two hours trying to get the windows at the front to open, having been painted shut, apparently even before our recent refurbishment. I employed a pizza slicer and a knife for this purpose, and was eventually victorious, on at least one of the windows, which I determined would probably be good enough for the purpose of ventilation. Erika seemed to be fine after that first night, so I assume whatever it was either was something entirely unrelated, or indeed was improved by my efforts to get as much air in as possible. The rest of the day was mostly spent unpacking boxes and trying to introduce some level of sanity to the place. This was of course not helped by the fact that following our (relatively modest) building work, just about every surface - including the inside of drawers - was covered in white dust. By lunchtime we'd just about unpacked enough kitchen stuff to make a basic meal. So this was the first meal we cooked in the flat - some kind of pasta, I forget exactly what the sauce was. I think we probably popped out to the nearby shopping street, possibly several times during the day, to buy various odds and ends, but other than that pretty much the entire day was devoted to unpacking. Finally the big day! We got up early to make a start on packing, but quickly realised we'd rather just leave the majority of it to the moving people, who'd do a better job, and instead snuck off to the Regency Cafe for one last breakfast as locals, before dropping Erika off at nursery (her last day at the current place, sadly) and then going back to face the boxes. Actually, the packing really wasn't too bad, there were two people from the moving company who were of course very efficient, and I pretty much focused on the bedroom, whilst the professionals took care of the kitchen and the lounge. By about 12:30 it was mostly done, and at that point Chie and I left the movers to it so we could get the tube to the new flat, and try and clean up a bit (the builders had left a lot of dust behind) before every conceivable bit of floor space was covered in moving boxes. I didn't linger there too long, as one of us needed to go back to the "old" flat for the checkout appointment, and also to pick Erika up from nursery. I decided it would be a good idea to pick Erika up first, thinking it was important for her to have a chance to say goodbye to the flat properly, as it was the only home she'd ever known so far. Plus, this had the added benefit of taking up the majority of the attention of the nice lady who came round to do the checkout inspection, and who therefore didn't notice the various marks on the carpet, sofa, coffee table, etc. Good work Erika. In the interim since we'd left the old flat had been professionally cleaned with impressive speed, and in the absence of all our clutter it looked really nice - I wanted to move back in! We couldn't linger though, as I wanted to get Erika on the tube before the rush hour got too crazy. So we said our final goodbyes, and headed up North. Meanwhile there had been a bit of drama at the new flat, we'd paid for a parking suspension to the moving van could park outside the flat, which people had then just ignored and parked there anyway. Amazingly, without having to say anything, a tow truck from Camden Council appeared and towed the cars away. We felt a bit guilty about this - not exactly a great way to ingratiate yourselves with the new neighbours, but the guys with the tow truck just got on with it without saying anything to Chie or the moving people, so not much we could do I suppose. By about 5:30 the movers had gone, and what had this morning been a nice, newly refurbished, and above all empty flat, was now filled to the brim with boxes. Boxes everywhere. We didn't feel quite up to unpacking enough of the kitchen stuff to attempt to make a meal, so I think we went out to get takeaway instead - probably from the Chinese place we'd been to a couple of times before we moved in, but I forget now. Erika became a bit poorly in the evening. I suppose it could have just been a side effect of all the excitement and rushing about, but she was feverish, and was sick late at night. I began to worry that all our efforts to make the place as healthy for Erika as possible (the last minute change to wood floors rather than carpet, etc) had been in vain. Possibly it was a reaction to paint fumes, or maybe the varnish on the bathroom door? I spent the next morning furiously ventilating the place, and whatever it was that caused her to be ill the first night turned out to be a one off, so maybe it was just that. I was feeling a bit down in the dumps today, I think partly because the reality of imminently no longer being a resident of genteel Pimlico was sinking in, and the prospect of the move tomorrow was a bit daunting. So to get away from it all I decided to go for a very self indulgent lunch at Le Caprice, which had come to my attention since it's just round the corner from my club. The strozzapretti with perigord truffles was a fittingly luxurious sort of dish, and I surprised myself by ordering a baked Alaska for dessert. I went to the flat for one final check this evening, and was impressed to see the new wood floors had been laid, and it did look pretty close to being finished. On the way back home (which is an odd phrase, because in two days time "home" would be the place I was travelling from, not the place I was travelling to) I stopped off at Green Park, to have a drink at my club. As always, it was a bit dead, so after a quick drink I instead went round the corner to Dukes Bar, which was much more lively, and, of course, the drinks were better too. Pancake day today - Chie made okonomiyaki which seemed somehow appropriate. I've got a motor-car and a basket of strawberries and a bottle of Château Peyraguey - which isn't a wine you've ever tasted, so don't pretend. It's heaven with strawberries. I managed to find a bottle in Jeroboams, in Belgravia (Chateau Lafaurie-Peyraguey to be precise, the original Peyraguey split into two chateaus at some point post Brideshead). I designed the rest of the meal around that - which was an interesting challenge, as it's a dessert wine. So we had ratatouille, potatoes dauphinois and baked mushrooms for main course followed by the Chateau Peyraguey, strawberries and macarons from Pierre Hermes. Just as Sebastian promised, it was heavenly, both Chie and I really enjoyed it (and Erika enjoyed the strawberries). Went to the new flat again to check progress this morning, the penultimate time before we'd actually move in - less than a week to go now! It was nice to see the new kitchen sink had been installed, and the bathroom sink, plus cabinets and the towel rail there - still no toilet yet though! After that we went for lunch at Spaghetti House (where Erika enjoyed playing with the leftover valentines balloons) followed by coffee and a play with the toys in Bear + Wolf. Erika got a scooter today - a hand-me-down from one of Chie's friend's kids. I'm not sure she's quite figured out yet how to make it go, which is probably just as well as her helmet doesn't fit her particularly well yet, so it didn't see particularly strenuous use. As it was valentine's day, as has become something of a tradition over the years Chie and I have been together, I made lasagne for dinner. Spent a bit of today organising the new last-minute-change-of-plan wood flooring for the new flat - which bizarrely included reading a technical certificate in Polish about the emissions release of the wood flooring we eventually chose. Not much else to report! Chie took the day off today to take Erika to the doctor for what seemed to be yet another chest infection. She got yet another course of antibiotics. In a somewhat timely fashion, we'd had an email from Robin yesterday, after I'd mentioned the fact we were planning on having carpets laid in the new place on the 18th, two days before moving in. He questioned whether this was wise, given that, in what turned out to be news to me, apparently carpets, and new carpets in particular, can be really bad for you if you have respiratory problems, because of a combination of VOCs (volatile organic compound) like formaldehyde, dust mites and so on. Given Erika's current illness this rather struck a chord, and I made an executive decision that we wouldn't get carpets in the new flat after all. So I got in touch with our project manager who rather impressively turned this around in about 24 hours, cancelled the carpets, negotiated for us to get at least some of the money back for them, and ordered wood floors instead. Amazingly it ultimately all got done before we moved in. Erika had a hospital appointment today, for the issue we took her to the doctor a while back - the possible hypnagogic jerk, or whatever it turns out to be. I volunteered to take her this time so Chie could go to work (particularly as it was a tricky thing to explain). This was just an initial consultation with a pediatrician who didn't have any immediate diagnosis, and booked an EEG for next month and a follow-up appointment. Decided to keep Erika at home today, so Chie stayed with her and I went to work. Erika had been a bit feverish the night before, we took her to nursery today hoping it wouldn't come to anything, but her fever came back again in the daytime. I think we had something vaguely Chinese for dinner. Chie and Erika had their own plans for some of the daytime, leaving me to my own devices for a bit. I started off by going to the flat to inspect progress on the building work. Less than two weeks remained until we'd be moving in, and I think actually (contrary to what I'd expected from watching Grand Designs) things seemed relatively on track - the bath appeared to have been plumbed in, the tiling completed and the floor laid, the radiator bench looked pretty much finished, and the area around the partition wall we'd had removed was all nicely smoothed off. After that my thoughts turned to lunch, and I was keen to try and find somewhere with a really good vegetarian Sunday roast. So I popped up to Highgate, and went into the Wrestlers, which delivered exactly that. Whilst the centre piece veered slightly unfortunately into the territory of sweet potato and goat's cheese, the roast potatoes were very good, as was the Yorkshire pudding, and there was gravy - so I was very happy. The pub also has a really lovely interior, with wood panelling and an open fireplace - and there were lots of families with young children. Looking forward to future visits with Chie and Erika in tow. Went to an open day of a Japanese nursery in North London in the afternoon. We'd already made up our mind where Erika's new nursery would be after we moved, but I think partly Chie was interested to see what a Japanese nursery would be like, and was also keen to find out if there was any possibility of her doing one day a week there or something (it's a bit of a trek from the new flat, so certainly not something we'd want to do every day). The open day was a bit of an odd setup - I'd assumed we'd just have a bit of a wander round, maybe a casual chat with the staff, and Erika might play with the toys a bit. Actually though they made a point of separating all the kids from the parents, and having all the parents sit (on comically small chairs for toddlers) and listen to quite a lengthy presentation, whilst listening to the kids - many of whom had never been to a nursery before - screaming for their parents in the next room. Erika, bless her, whilst also not happy about being surreptitiously dumped with strangers for half an hour, at least had the wherewithal to take action, and instructed one of the staff to lift her up so she could see us through a little window between the two rooms. Although we initially had our backs to her, we were alerted to her presence by a familiar little voice saying "Daddy miru" (miru being Japanese for "see"). I was doubly impressed, not just that she was ordering the staff about, but that she was also doing it in the appropriate language for her current environment. Popped out at lunch time to go and take a look at Thresher and Glenny, an interesting little tailor tucked away in one of the alleyways of Temple (and therefore, presumably, mainly providing clothes for members of the legal profession). They had a sample sale on, I tried on a few suits, but didn't find anything quite right (and even at half price they still weren't cheap for an off the peg suit) so I ultimately left empty handed. Went for a burrito round the corner then back to work. In the evening we had fish and chips for dinner, with fake fish from Holland and Barrett. Similar to yesterday, trying to reconstruct this six weeks later. Apparently went to Sainsbury's on the way home and was at a complete loss for what to cook for dinner. Attempting to write this over 6 weeks after the fact, and very little to go on - from my location history it looks like a normal routine of dropping Erika off at nursery, going to work, then going home again. On the way home, I apparently (according to chat history) went by way of little Waitrose. I'm guessing as it was a Wednesday we probably had pasta for dinner. Looks like I searched for "italian deli" in the afternoon which also suggests Italian food was on my mind. Setsubun, the 3rd of February, heralds the beginning of spring in Japan. The occasion is marked by a member of the family dressing up in a sort of devil mask, and then exclaiming "bad spirits outside, good spirits inside". Whilst throwing dried beans. We did a miniature version of that this evening. For dinner I attempted to make something vaguely Mexican - Quorn chilli served confusingly with flour tortillas and various other trimmings. This was interrupted by one of our neighbours setting off an emergency alarm, which prompted me to go and see what the problem was. She is rather advanced in her years, and, I hope I will not be considered unkind for saying, not entirely in possession of her faculties. She started embarking on her life story as I attempted, in vain, to find out what the actual problem was which had caused her to sound the alarm. After a while, without any actual tangible problem having been identified, Chie and Erika came to rescue me. Erika was of course an instant hit, and the requirement to put her to bed allowed me to be excused from my assistance in whatever it was I was supposed to be assisting with. Despite my best efforts to ever so gently encourage Chie to come to a decision, we still hadn't chosen the flooring for the new bathroom yet. In a move that was no doubt intended to help, although in practice I'm not sure whether it did, we received yet more samples today. Anyway, one way or another either this evening or tomorrow morning we did finally manage to commit to one of the flooring samples (from pretty much the first batch we'd seen). Made sort of Thai food for dinner - it's a bit of a challenge to make something like a Thai curry which is OK for Erika to eat. I used kaffir lime leaves and fresh coriander, plus coconut milk - I think it sort of worked, it was fragrant but not spicy. Went to the new flat for a bit in the morning to check on progress. Construction of the radiator bench is now underway, although it was just a bare skeleton and looked pretty naff at this point. This is something we'd decided to have on a bit of a whim, on the suggestion of our project manager / interior designer, who suggested it would help make use of a bit of dead floor space as a result of having another radiator installed. It seemed like a nice idea to be able to sit in the bay at the front of the lounge, looking out through the window to admire the wheely bins and generally horrible state of the front garden. Also after what has felt like weeks since the old bathroom was stripped out, and it being left as a rather depressing empty shell, it finally looks like some progress is being made on fitting the new bathroom. 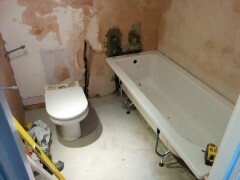 The new bath tub had been put in place, although not plumbed in yet, along with the old toilet (we do apparently have a new one coming, but haven't seen it yet), presumably just to figure out rough measurements etc. The floors and the walls had been smoothed over, and one wall had some tiles put in place. When I got back to our current abode, the girls were out in the gardens having a run around. Chie went out for the afternoon after that, to have a Mums only (no kids) afternoon tea with some of her friends. So I stayed home to look after Erika, who spent some of that time having her afternoon nap. Towards the end of the afternoon, when Erika woke up there was still a bit of daylight, so we rushed out for a last chance of the day to go to the playground. After that I attempted to do a bit of food shopping with Erika in Little Waitrose but on being told she couldn't have a cake (she just eats the icing off the top, and it's really not good for her) she threw a bit of a fit, and I left hurriedly and empty handed. Which was a bit embarassing. Her protests continued until we were about half way home, when I finally managed to persuade her to have one of the healthier snacks I'd brought with me instead. Not a particularly healthy eating day - started with breakfast at the Regency Cafe. It was a somewhat bittersweet visit, I couldn't help but think it might be the last time we go as locals. From there we walked to Victoria Street, and then got on a bus to Trafalgar Square. We bought Erika a new coat in Mountain Warehouse - it's a bit ugly, being bright pink and very modern looking, but it's been quite cold recently and I fear the cute little duffle coats etc for toddlers sold in normal clothes shops just aren't really very well insulated. After that we took in Fortnum and Mason, Uni Qlo, and then went to see the Rubens exhibition at the Royal Academy (Erika was asleep for this bit). We then headed home, and took advantage of the remainder of Erika's nap time to try and have a bit of a clear out ahead of our move. I successfully bagged up some old clothes and took them to a charity shop. So I said goodbye to a couple of old jackets, including this one, and the "Man from Del Monte" suit. To reward our efforts, when Erika woke up we had tea and cakes I'd bought in Fortnum and Mason - the Victoria sponge in particular was very nice. For dinner, Chie had spotted a flyer that had come through our door for a pizza place which made quite extensive use of Quorn, including various types of Quorn toppings, and "PopQuorn chicken" as a side dish. Fully accepting that it was going to be out and out junk food, we ordered a pizza (with Quorn peperoni cubes) and some of the PopQuorn chicken. I don't think any of it was great, but it made a nice change. We ate it whilst watching Toy Story 3 (for no particular reason other than it seemed like the sort of thing Erika might like, and it was free with Amazon Prime). Erika generally tends to lose interest in anything longer than the typical CBeebies programme but impressively she sat through most of this and seemed to quite like it. We were having a new door installed at the new flat, and since this wasn't organised via the project manager who is coordinating the rest of the work for us, this meant I had to be there to let the carpenters in, and then be back later on to get the new keys from them etc. Since it was a bit unclear how long this was likely to take I decided to just take the whole day off, hoping that inbetween I'd be able to have a bit of time to myself to do my own thing. So after letting them in and making sure they had everything they needed, I left them to it, and headed into the centre. My first port of call was Norton and Sons on Savile Row, who I like to airily refer to as "my tailor", to discuss possibly having a summer suit made. Whilst I love the current one I have from them, it's a medium weight cloth, fully lined, and there's a lot of internal structure in the jacket (a "floating canvas" and so on) which makes it quite a thick and well insulated garment - so it's often hot too wear in the summer. I was pleased to discover they're quite happy to do a half lined, or even entirely unlined jacket (somehow that didn't feel very Savile Row to me) and had a large range of swatches of lightweight cloths to leaf through. Didn't actually order the new suit though, still mulling it over. It's a bit of an odd position to be in at the moment, financially speaking - for the last few years I've been holding back on any kind of major spending, thinking that the money should instead be put towards buying a flat. That's out of the way now though, so what next? I suppose the obvious answer is saving up for a bigger place, but that feels like the start of an endless cycle and London seems like such a black hole of cash when it comes to property. After leaving "my tailor" I wandered down to Jermyn Street to have an idle browse around, and then meandered from their to my club. It was too early to go to the bar, so I suppose you'd have to call it morning coffee instead. I sat by a tall window watching the people below in Green Park come and go. It was quite pleasant. I headed back up to NW5 after that to check on progress at the flat, and since they still seemed like they were quite a way off, I went and got some lunch at the Pineapple, where they do some very popular (and very cheap) Thai food. I wiled away some of the remainder of the afternoon in the Southampton Arms, and also went back to the flat for a bit for a cup of tea with one of the builders, who had been working on the bathroom today. Our builders are apparently not of the usual Polish extraction, but are in fact Bulgarian, it turns out. When eventually the carpenters had finished installing the door I got the new keys from them, and then headed back down to SW1 to pick Erika up from nursery (Chie had decided to go to work today). Went to meet Al for lunch, for a chat about his upcoming wedding over some pizza at the new branch of Franco Manca near Goodge Street. Chie went out in the evening, and for dinner I made an ad hoc pasta based creation for me and Erika, with fresh macaroni in a very garlicky tomato sauce with courgettes, Quorn meatballs and mozzarella. I thought it was really tasty, but maybe a bit too garlicky for Erika. Found some Crodino in an Italian deli on the way to work this morning, which I thought would be a good idea as an occasional healthier (i.e. alcohol free) alternative to the after-work Negroni I often enjoy. Although I think in hindsight I probably wanted to buy Sanbitter rather than Crodino. Ooh! This is entry number 4000! Busy at work today, and needed to work a couple of hours later on in the evening to get something finished. Other than that not much to report. Got several bits of moving admin out the way today (although for every item I tick off the list I seem to discover two more to add on to it). Still, I felt briefly satisfied at the progress today - most significantly I managed to sort out our internet connection at the new place. Also made a decision on the carpet for the new place today - it's really quite dull (beige, it always ends up being beige) but hopefully that'll make it inoffensive and easier to sell the place when the time comes. The decision was helped somewhat by happy circumstance of happening to check the company's website and notice a "flash sale" or some such, which overall will save us about £500. Considering how so many of the other costs associated with our refurbishment work inevitable crept up beyond the initial estimates (bloody firehoods! ), it's nice to have it go the other way round for a change. In the evening as always I fancied Chinese food, it being a Monday, and went to the only Chinese takeaway in our current neighbourhood. It was rather disappointing. I've probably gone on about this to the point of utter tedium but I'm continually bewildered at the lack of takeaways where we currently live - there seem to be a lot more in the new area we'll be moving to next month. Although I suspect this isn't really something to be celebrated too much, as I have the impression it's actually one of a number of indicators of a less well to do part of town.